Steve Middendorf is making good progress on his Spirited 230 project and is hoping to launch in the next 6 weeks. 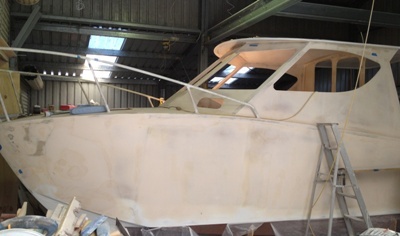 Close to painting stage with all structural work completed and faired, this boat is set up for relative extended cruising with most amenities and cruising features such as good solar charging, large top loading built in fridge and long range fuel tanks. Steve has even gone to the extent of building his own composite bow rails which look great! Powered by 2x 70hp 4 stroke outboard engines and we look forward to the performance report. Steve's workmanship is meticulous with good attention to detail. We expect the painted finish will present accordingly. We will keep you up to date close to launching.